This is for all the volunteer campaign workers of both candidates in Mass., trying to get out the vote for their candidate. If Martha Coakley loses the U.S. Senate race in Massacussetts, can she delay the certification of the results and Scott Brown's taking office by asking for a recount? If Scott Brown loses, can he do the same to her? At Politico, Radley Balko summarizes Martha Coakley's prosecutorial over-reaching during her career and the threat she poses to those who care about criminal justice reform. As a member of the Senate, not only would Coakley be creating new federal criminal laws; given her record as a prosecutor, there’s a good chance she’d serve on committees with oversight over the Justice Department and the judiciary. She’d also be casting votes to confirm or deny federal judicial appointments. Advocates for criminal justice reform should be wary. Coakley may share Kennedy’s opposition to the death penalty, but her record as a prosecutor leaves plenty of doubt about her commitment to justice. I hope if you live in Massachussetts, you don't vote for Martha Coakley. My prior posts on why she should not be Senator are here and here. Can't say I didn't warn you about Martha Coakley. The latest: a Bait and switch. During her campaign to replace Sen. Ted Kennedy, she said she wouldn't support a bill with restrictions on abortion. Today, she announced her support for the health care bill with its restrictions on abortion funding. 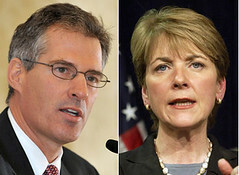 Coakley’s stand was a major point of debate during the campaign; several of her opponents criticized her for being willing to sink the overall health care bill over a single issue, but she insisted that there were some things on which she would not compromise. I'm not happy about this, but here it is. Mass. Attorney General and former state prosecutor Martha Coakley won today's Democratic primary election to replace Sen. Edward Kennedy. I've never thought Martha Coakley would make a good U.S. Senator. I'm even more convinced now that she has signed her name to a brief restricting death penalty appeals, while claiming to be against the death penalty.